I'm sure if you think Jay Z right now, you think Elevatorgate, but there is more to Jay Z than getting beat up in an elevator by Solange Knowles. He is also a good friend of Kanye West's and, according to a report from Radar Online, Jay Z has agreed to be Kanye West's best man. Still, don't be surprised if he doesn't show up. While it would make sense for Jay to be Ye's best man on the surface, this report is one of the most ridiculous sounding reports I have ever heard. So why am I writing about it? Because it's one of the most ridiculous sounding reports I have ever heard as, as such, it's absolutely hilarious. Originally, there were reports that Beyoncé and Jay Z would not even be attending because they don't want to be filmed for reality TV and because Beyoncé has a weird rivalry with Kim Kardashian involving a dermatologist or something. But now, a source who spoke with Radar says that they both RSVP'd, that Jay Z sent Kanye a touching wedding present, and that Kanye freaked the hell out when he heard the news. The best news came when Jay sent a gift to Kanye with an inscription referring to Jay Z as the rapper’s ‘Best Man.’ The gift was a gold-plated, diamond-encrusted flask, delivered with a $10,000 bottle of scotch, for Kanye to have for his wedding day. If this part is true, this doesn't necessarily mean that Jay Z is participating in the wedding. I would not be surprised at all of Kim and Kanye forgo a traditional wedding party. It would keep the focus on themselves. 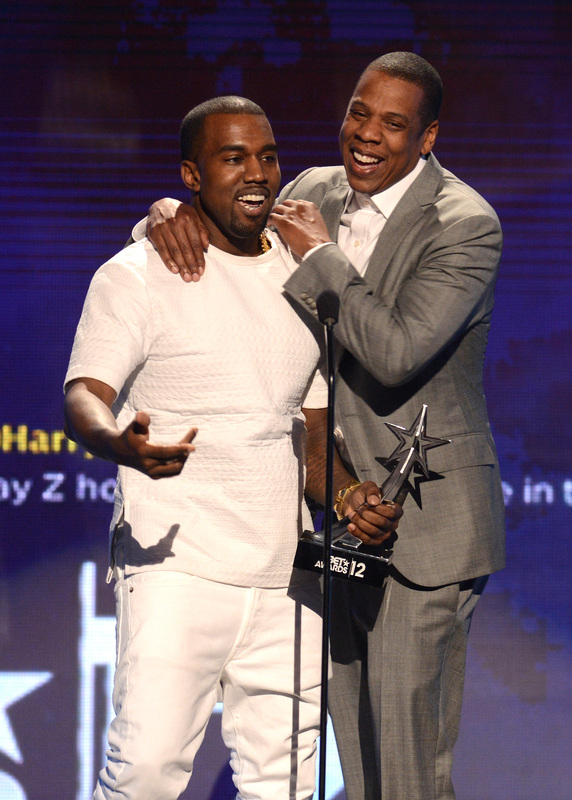 You can have Jay Z there towering over Kanye on his wedding day! Kanye was almost jumping up and down, he was so excited. He was running around Kris‘ house to find Kim saying, ‘Baby, look! Look! Jay and B are coming!’ Kanye has been begging Jay to reconsider his decision not to come to the wedding, an even more devastating decision that left Kanye groomsman-less when he declined being his best man during the televised nuptials. Can you imagine? Seriously, take a moment and imagine Kanye West running around Kris Jenner's house in an expression of pure joy. It's freaking amazing. But even though it's a funny picture, it's an unlikely one. How would this source know what Kanye said in the house? Is it Bruce? Is it Kylie? Is it a cameraman. Actually, it could be a cameraman, but because Kanye isn't often filmed for Keeping Up with the Kardashians we'll never see this go down. We also may never know if Beyoncé and Jay Z really go to the wedding because supposedly they don't want to be in any photos either. We'll just have to keep this one in our imaginations or hope Kris Jenner "accidentally" spills the news.